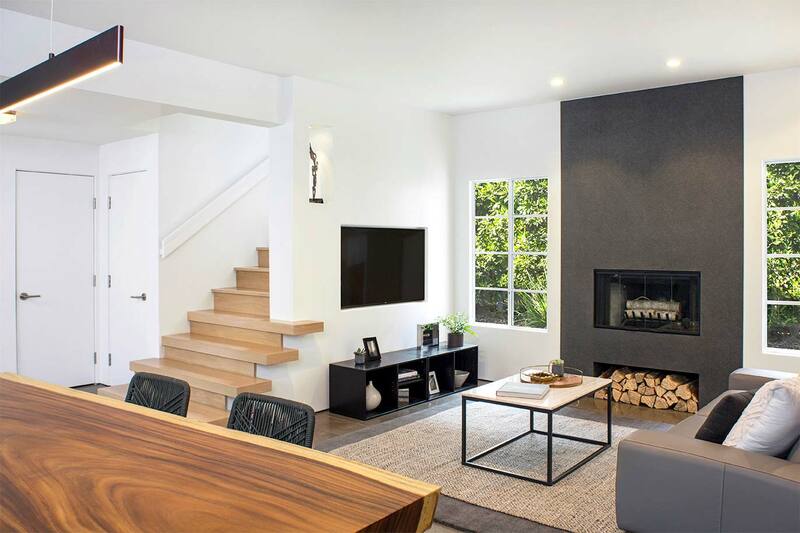 Beauty and modern living inspired our clients to take on this major interior remodel. 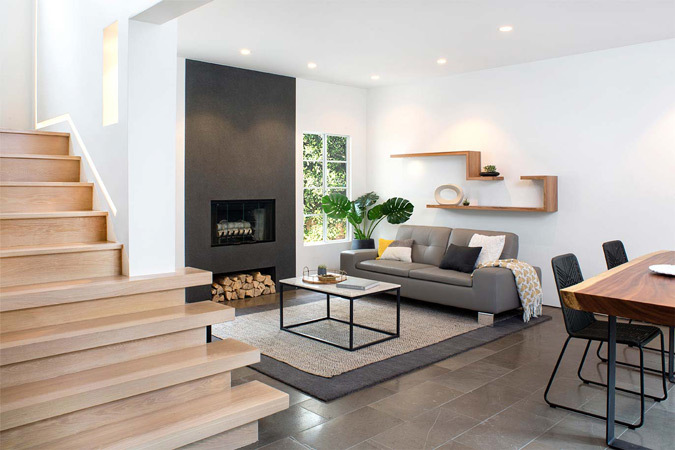 This townhouse is part of a historic area in Pasadena and although the exterior has all the charm of the neighborhood, its interior space was due for a major redesign. 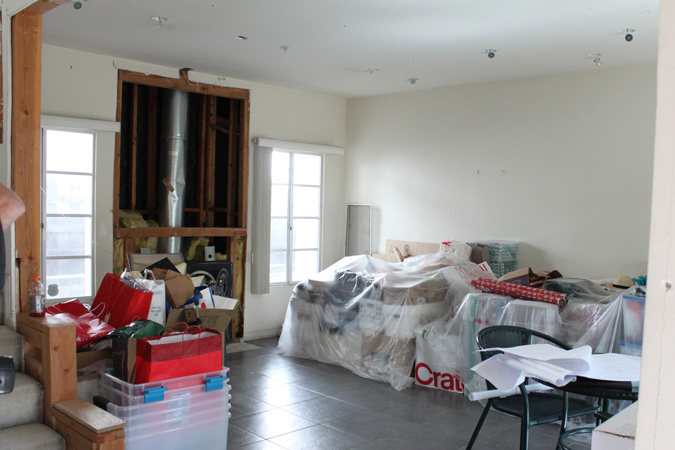 The scope of the project focused on renovating the entire first-floor living space. The original 12×12 ceramic tile flooring was replaced with new dark gray, plank style tile to better complement the new limestone fireplace surround. This highly resilient stone boldly stands out against the Dun Edwards’ Faded Gray paint used on the living room walls. Functional and contemporary, red gum floating shelves were added to the space to give the room a chic feel. Another major aspect of this project was the redesign of the staircase. The carpet floor finish was taken out to make space for new wood stairs with exposed treads. A new custom metal handrail and inset wall lighting fixture along the stairs are notable modern elements. 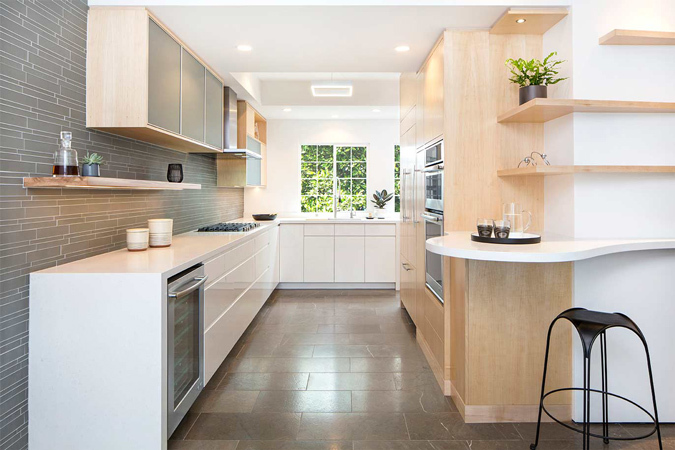 The kitchen remodel focused on creating a gentle transition from the adjacent spaces while still incorporating a more minimalist and modern look. 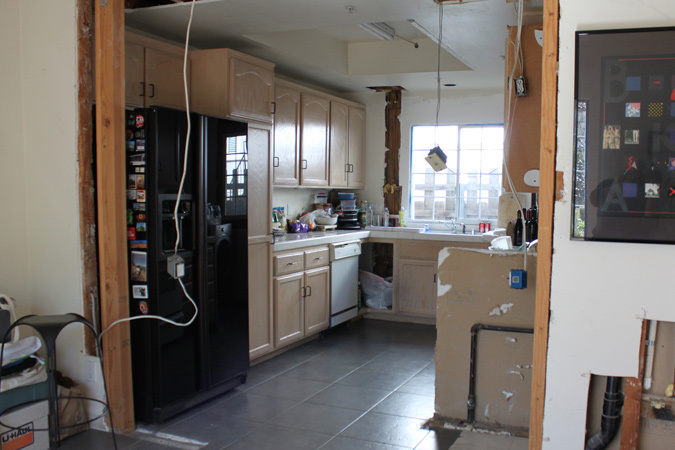 The existing kitchen was completely demolished. 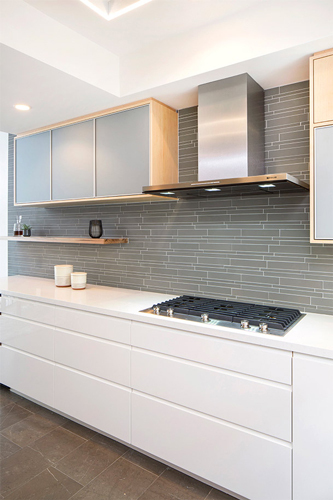 We continued the flow of the muted palette by coupling a soft gray-green glass backsplash with a white, high-gloss lacquered base cabinet for the cooktop. This was balanced by the natural finish of the opposing maple cabinets. A curved countertop beneath floating shelves connects the kitchen to the adjoining den, living room, and dining room. The frosted glass on the kitchen cabinets softens the look and allows for discrete storage space. Jenn-Air’s 36” Gas Cooktop has a low profile and in combination with the 36” Low Profile Canopy Wall hood delivers a seamless and sophisticated design within the kitchen. To see more photos of this beautiful transformation, visit our portfolio.